COLOR(S):Black (sometimes with a brownish cast or dull) and white. They should be about 70% black and 30% white. The Karelian Bear Dog, also known as the Karjalankarhukoira, is a sturdy and well equipped hunting dog. They are used mainly for hunting still, and are not well-known outside of their native Finland. They are fierce dogs towards their prey, virtually fearless when pursuing their prey, which can be elk, boar, or bear! Karelian Bear Dogs are tough, independent, and excellent guard dogs. They are alert and aware of their surroundings, making them excellent watchdogs as well. The Karelian Bear Dog is mostly housed outside by owners in order to acclimate them to colder temperatures. Their bodies are clothed in harsh, medium length double coat designed for winter weather. They have triangular prick ears, excellent for listening to where the prey is. They come in colors of black and white, usually with white on the underside and black and top. Karelian Bear Dogs live up to their name in their aggressiveness towards other dogs and other animals. Forming a strong bond with their owner, the Karelian Bear Dog is a one-of-a-kind breed for the hunter, not as a family pet. Karjalankarhukoiras are strong, fearless and powerful. They share a close bond with their immediate owner, but are not good family pets. They do best as hunters. They have an excellent nose and a high prey drive, making them unsuitable around smaller pets. They are dog aggressive, but do fine around children. They are even tempered with friends and family, but wary of strangers. They will guard their own to the death if needed. Karelian Bear Dogs are solitary dogs, often preferring their own company to anyone else\'s. For this reason, they usually hunt alone and do not get along with other dogs. They are very courageous when called to be. They are said to be quiet unless they have cornered their quarry, in which they will bark until their master comes. Usually black on the back, tail, and face, with a blaze of white up the middle of the face, on the throat, chest, feet and tail tip. The underbelly is usually white as well. Karelian Bear Dogs need a lot of firm training. They should always be leashed in public, and kept away from other dogs. They should be socialized as well, to decrease the risk of an overly aggressive or nervous dog. Bathe them as necessary, brushing their fur when needed as well. Ears should always be checked for dirt or infection. Nails should be clipped regularly. There are no known health concerns with this breed. Exercise is a must with this breed, as they should be exercised for an hour daily. 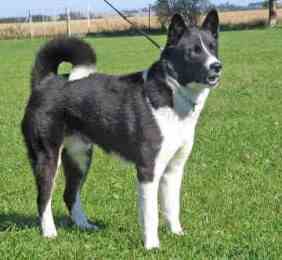 The Karelian Bear Dog is independent, outdoorsy and sometimes acts like a wolf with other dogs. They need a fenced yard and space to work in. They are also active, and need jobs to do. The best owner for this breed would be an experienced, active owner living in a rural environment with a job for the Bear Dog to do.